The story begins with a young man assisting customers in a Fremont, Nebraska Sherwin-Williams store during the 60's. 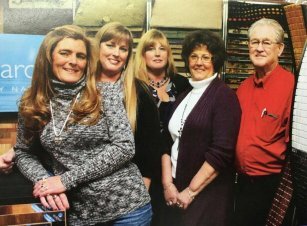 Page to the current chapter and that man is Roger Frye, owner of Roger Frye's Paint and Supply, Inc. store located in downtown Rapid City, South Dakota. Along with his wife, Eva, and three daughters, Jodie, Julie and Amy, the family has established a reputation for offering superior service and premier paint products. The history behind Roger Frye's Paint and Supply, Inc. is filled with a passion for excellent customer care, the finest paint products and supplies, and competitive pricing. In 1972, Roger was transferred to Rapid City as the new manager of Sherwin-Williams Paint Store. He spent 9 years building that business up. When corporate changes began taking place, Roger and Eva decided to open their own business. In October of 1983, Roger and one employee opened Roger Frye's Paint and Supply, Inc. Within a year, Roger's youngest daughter Amy came on board with her bookkeeping skills. Soon after Eva started helping out as they discovered that customers appreciated having a woman assist them with their projects. Julie was the next daughter to come help out and a few years later Jodie also joined the family team. Each family member is proud to have their own area of expertise. With an inventory that originally featured Dutch Boy paints and stains, the store now carries a wide variety of paint and stain including Benjamin Moore, Martin-Senour, Cabot, Superdeck, Pratt & Lambert, Penofin, Sikkens, Old Masters Penetrating Stain and several other brands. Roger Frye's Paint and Supply, Inc. is not limited to paint and stain, either. Their product lines have grown to include tile, floor coverings, wall coverings, and window treatments for residential and commercial buildings. Variety sets Roger Frye's Paint and Supply, Inc. apart, as does the level of service each individual receives. To the Frye family, the people who walk into their store are more than customers - they often turn into repeat visitors and even friends. No one is looking to simply sell a can of paint. Rather, each employee sees it as their duty to evaluate the details of every project, the goals, and the product that will achieve the best results. As opposed to large retailers who may not have any firsthand experience, the Frye's have specialized in paint products for decades. When customers visit Roger Frye's Paint and Supply, Inc., they receive more than paint - they receive expert service to address all of their questions and concerns. Since 1983, Roger Frye's Paint and Supply, Inc. has been Rapid City's trusted paint and supply specialists. Come in and see for yourself what sets this family owned business apart from the rest.